Finding records of Transport-office that John Smyth worked for in London prior to 1806? I have been trying to determine the occupation(s) of my 4th great grandfather John Smyth, who married Sara Osment on 13 Jul 1764 at Stoke Damerel, Devon, when a "Captain's Clarke ... on his majestys Ship Firm" (see What might word "wise" mean on 1764 Marriage Record of John Smyth and Sarah Osment from Stoke Damerel, Devon, England?). In his will (written 1804) he leaves £3,800 to his children which I think made him quite wealthy for that time so I am assuming he must have been quite successful in between his time as Captain's Clerk on the Ship Firm, and when he died but I have not been able to find any indication of what he did. From his will it appears that he had lent his son-in-law John Stacy (Linen Draper/Grocer in 1822, Grocer/Tea Dealer/Shopkeeper/Dealer in Sundries in 1830; in Exmouth, Devon) and his son Thomas Smyth (Oilman in 1818, Grocer/Tea Dealer in 1825; in London) money (about £250 each) before 1804 so I am thinking that he may have had knowledge of their business areas. 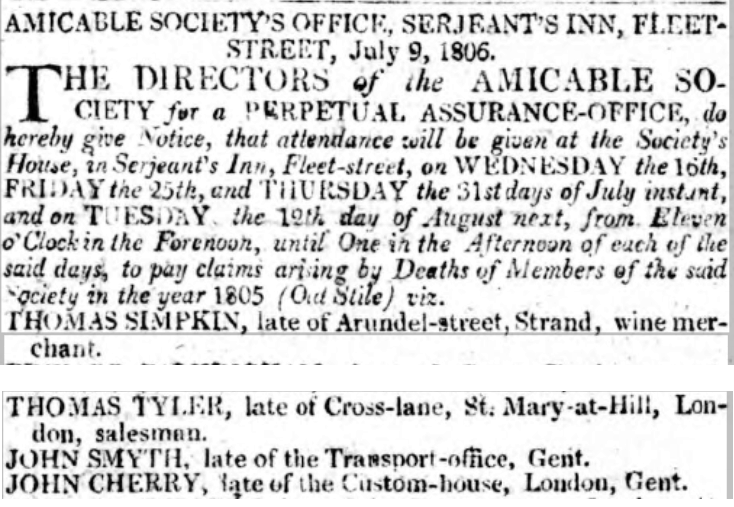 This seems to be the insured deceased who are about to have their life insurance policies paid out, and with John Smyth being buried on 23 Jan 1806 I am thinking that may have counted as "1805 (Old Stile)", and make this quite likely to be the correct John Smyth. If so, what would be the "Transport-office" that is being referred to, and is it likely that its staff records have survived? I am hopeful that details of the policy with "Amicable Society for a Perpetual Assurance Office" may also be available via The National Archives where there is an email address that I am going to pursue separately. As a footnote to this, I was able to obtain scans of the pages related to John Smyth in "NU158 Amicable Society, Claims register March 1806" and "NU1548 Amicable Society, Board minute book L 1796-1808" related to John's policies No. 908 (admitted 2 Nov 1775) and No. 527 (admitted 14 Aug 1783) which note his position with the "Sick and Hurt Office Towerhill but late of the Transport Office", and have the payouts of £160 for each policy being collected by his eldest living son, and executor, William Smyth on 31 July 1806. The Prisoners of War Department of the Transport Office employed three clerks with the surname Smyth. My 4th great grandfather John Smyth had sons named William (1773-1817) and Robert Osment (1774-1836). It looks to me like John had two sons working with him. I later found the same three Smyths, under the heading CLERKS IN THE TRANSPORT DEPARTMENT with the same job titles and salaries on page 220 of The State of the Nation, with Respect to Its Public Funded Debt, Revenue, and Disbursement;: Comprized in the Report of the Select Committee on Finance, Appointed by the House of Commons, to Examine and State the Total Amount of the Public Debts, and of the Interest and Charges Attending the Same, as They Stood the 5th of Jan. 1797: Particularizing the Receipts and Disbursements of the Several Undermentioned Offices. Looking at more pages from both sources I can see that both tables are referring to the same data which is dated 18 May 1797. Not the answer you're looking for? Browse other questions tagged 18th-century occupation london 1800s-decade employment-records or ask your own question. Meaning of “brought from” on early 19th century London burial record? Could John Stacy who lived/married at London and later lived at Exmouth (Devon) have been baptized in 1759 at North Petherton (Somerset)? What records might survive of nautical assessor who died on London Docks in second half of 18th century? Searching marriage records for London by witnesses?